Beans On Toast strides out onto the stage with just his guitar in hand and announces that he’s done with playing pubs, arena gigs are the only way for him from now on. With only a 25 minute set to fill, a voting system is employed to allow the crowd to pick the songs they wish to hear. It turns out, like all voting systems, the voting is rigged. Other key points observed by our incredibly relaxed opening act include that his song ‘Can’t Take Another Earthquake’ could be updated, updating the rhyme for “Libya” to “Syria”, because “it’s an old song, but there are new wars that rhyme”. It may be one of the biggest gigs Beans On Toast has played, but it doesn’t seem to phase him at all, at times his performance feels almost like a stand-up show. Before long Flogging Molly take the reigns and announce that, as Monty Python would say, “Now for something completely different”. Their Celtic-Punk sound gets the crowd dancing straight away as they begin by playing ‘Drunken Lullabies’. Seeking reassurance, frontman Dave King asks “I know I drink a lot, but this place is bigger than the academy, right?”. 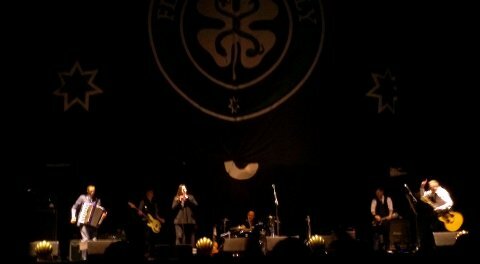 About half way through the set, and mid-song, the Flogging Molly banner hung behind the band suddenly falls, completely covering the drums. Somehow the beat is not disrupted at all, “you’ve got to love these spinal tap moments” is the response once the song has finished. Closing with ‘Seven Deadly Sins’, a good time was had by all, and I think Flogging Molly may have won a few new fans this evening. So we approach the time for the main event and the crowd is getting closer and closer to the stage. 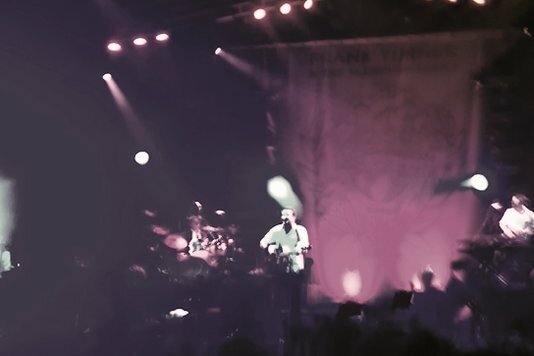 Frank Turner arrives and starts by playing ‘Photosynthesis’. A few years ago during ‘Photosynthesis’ the crowd would to be asked to sit down late in the song, in order to jump up when the cry “I won’t sit down” came from the stage. This evening, without even being asked to, many of those down the front took it upon themselves to replay this game and sat down of their own accord. I took this as a good indication that it was going to be a fun night. This is, at least for the next few days, the biggest headline show Frank Turner has played and it felt like a lot like a festival headline set. I don’t often get to arena gigs but at the handful I’ve been to it can occasionally seem like you’re surrounded by people who don’t really know why they’re there. Not so tonight, everywhere I look I can only see people having a good time. Mixing new songs and old there is something for everyone. Though most people around me know most of it anyway. Midway through the performance, ‘Wisdom Teeth’ followed by ‘Love, Ire & Song’ seems a definite nod to the fans who’ve watched the remarkable rise over the past few years. That said, the style and manner of the performance and songwriting doesn’t seem to have altered in that time, more and more people are just finding out about Frank Turner’s existence. The last song before leaving the stage for the first time is ‘Broken Piano’. The song is performed with genuine emotion and the pyrotechnics that greet its end almost feel like punctuation. Returning for an encore, Frank confesses to once claiming he’d never play ‘Ballad Of Me And My Friends’ again, but he plays it anyway. Being part of thousands of people screaming “We’re definitely going to hell, but we’ll have all the best stories to tell” is a lot of fun. ‘I Still Believe’ and ‘Four Simple Words’ complete the show and many people exhausted from dancing, but ecstatic, are left to slowly make their way out of the arena. I can honestly say I’ve never had so much fun in an arena and any concerns I may have had about it being too big a venue were unfounded. It seems Frank Turner can play, and indeed storm, absolutely any stage.